Element "Facebook comments" in website builder WebWave allows users to leave comments on your website through Facebook. Users can comment directly from your website using their Facebook accounts. In this article, you will learn how to build a website with Facebook comments. Facebook comments can be added through the toolbar on the left side of the builder. Select a comment icon and drag and drop it to your website. You can set element width by clicking on it and moving frame sides. Height wil automatically proportionally follow to fit all content. 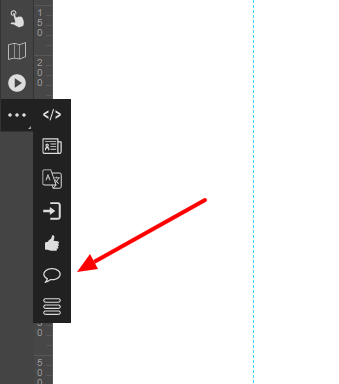 In order to open element settings, click on it and select side edition panel. 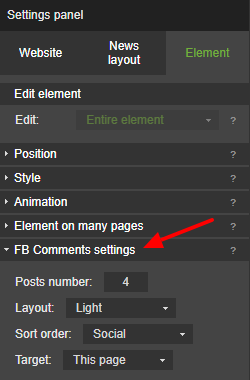 Find "FB comments settings" and adjust element style and content. Set posts number, which will be displayed in the element. The number of posts affects element size. Choose between two available layout styles. Time - displays the newest comments. Reverse time - displays the oldest comments. Social - displays comments with the bigger number of likes, comments, and shares. This website - a website on which Facebook comments element is. Commets will only be displayed on this website. Custom link - a website of a certain link. Comments will be displayed in every Facebook comment module with this link.